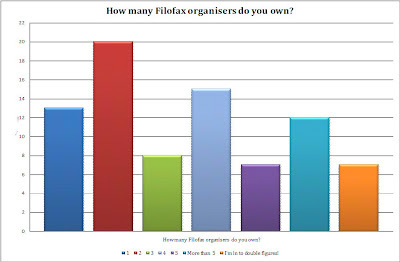 Following on from 'How Many' we are again running another poll, but this time it is What size Filofax Organisers do you own. Again we ran this a couple of years ago. Tick as many sizes as you own before you press the vote button. Again thank you to everyone taking part in this poll. 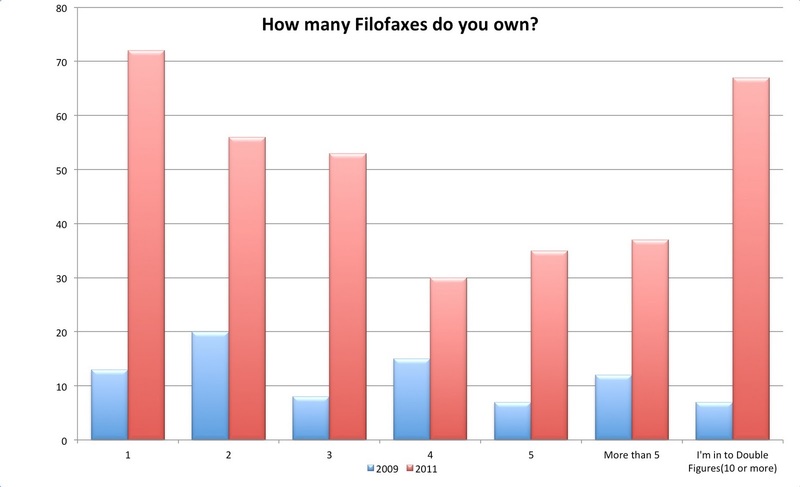 We asked the question again about How Many Filofaxes Do You Own? Thank you to the 350 people that responded, quite a turn out. Two years ago we asked the same question and got 82 people to respond, so a big increase and a more representative sample size to look at. This year I increased the number of categories to improve the accuracy of results. So here are the results, click on the picture to see a full size version. As you might expect people owning only one Filofax out number the rest and it drops off more or less as expected, but then starts climbing back up again once you get to 10 Filofaxes! I then recalculated the numbers based on the categories from two years ago so we could compare the two results more closely. This produced a few surprises! Here it is in percentage terms, only having 3,4 or 5 is decreasing! Thanks again to everyone that took part and please take part in the new poll in the side bar. Again a rerun of one we did 2 years ago. 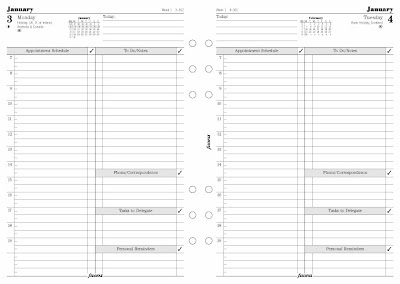 Last Christmas I came across a site on line that created an A4 diary as a PDF, this you can also print in A5 using booklet print. I made the files available in the files area. I've just added the 2012 files to the page as well. 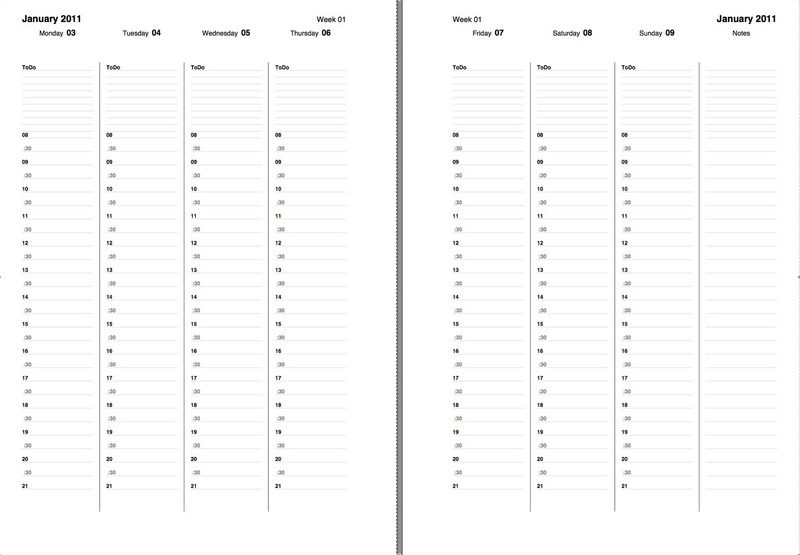 There is also my own year planner which I created in Excel, which has been updated for 2012 and 2013 dates. 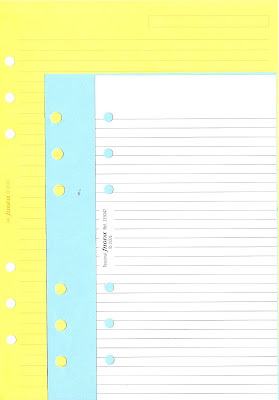 Hope you find these of use along with the other templates available on our Files page. When? - Sunday 6th November from 10am (US East Coast time), 3pm London time, 4 pm Paris time 9pm Jakarta etc. See the clocks at the top of this post to see roughly what time you should be on line. Don't forget that the North America or some states go back an hour on the night of 5th/6th November. Hope to be chatting with you on Sunday 6th November. Just had news of some great promotions on offer at Neal Street that might be of interest to anyone. Flex - Purchase a Flex & receive a complimentary pack of Jot pads. "The Generous Seasonal Reductions" has started - All colour & sizes of Finchley, Amazona, Deco, Siena & Adelphi are all half price... so are all sizes of Chameleon Black & Spring Green. Today, Temperley London’s innate fashion style joins forces with Filofax’s elegant form. 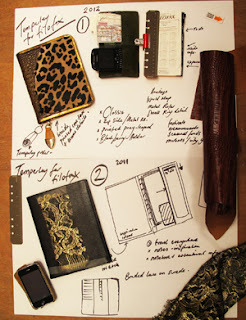 The British heritage brand Filofax is proud to reveal a fitting partnership with the British renowned designer Alice Temperley, MBE heralding the forthcoming arrival of a unique and exquisite collection by Temperley London for Filofax, “Your Life in Your Hands”. Famed for her timeless, feminine designs with beautiful prints and elegant lace detail, Alice Temperley brings her signature style from the catwalk to the palm of your hands. The accomplished womenswear designer has partnered with Filofax to create two stunning limited edition organisers to be launched during London Fashion Week A/W 2012. With a self-confessed magpie like approach to finding inspiration for her fashion designs, including a penchant for collecting memories, notes, photos and sketches, as well as keeping a hectic schedule organised, Alice Temperley finds the perfect companion in Filofax; another British icon that puts originality, creativity and achievement at the heart and enables the creation of a unique and personal record. The new Temperley London for Filofax Collection is designed to provide a private space for originality and creativity, in a timeless accessory to treasure. Each individual Filofax will be handmade from the finest premium leathers and fabrics, bringing to life two original and distinctive designs, making them a must-have fashion accessory for the upcoming season. Alice Temperley recently marked her tenth anniversary in fashion by launching a new coffee table book, True British - where Alice Temperley tells her story over the last ten years. Eclectic, rich in content and personal, Alice delved into her archives including her old Filofax to collate the material. Alice was inspired by this journey to create a new bespoke Filofax, with a distinctive tailored design inside and out, which others can use to capture the defining moments and hand written detail of their own lives. Filofax, the original word in paper-based organisers, marks a fashion focused step with this creative partnership. Recently seen on the laps of leading fashionistas at London Fashion Week this season, Filofax is enjoying a timely renaissance in the hectic digital age, as self-fulfilled creative individuals hark back to the privacy, importance and simple pleasure of making handwritten notes. The “Your Life in Your Hands” Collection brings forth a unique and desirable fashion accessory that can be used to capture the minutiae and inspirations of daily life. I've always appreciated, and been fascinated by, Filofax's effort to provide its diaries with reminds of all important dates for people around the world. Even the moon cycles are indicated for those who need to know (or just like to know) that information. Another case in point: Time-change reminders. This weekend, your Filofax will tell you that, if you're in Europe, it's time to turn your clocks back an hour. "Summer Time" is over. In the US and Canada, "Daylight Saving Time" ends next weekend. One important date that's not indicated is the end of the world, although according to some, it was supposed to be May 21, 2011, until it was changed to October 21, 2011. Has anyone checked their Filofax for December 21, 2012? The entries will now be forwarded to Filofax, who will be getting in touch with the people named above regarding your prizes, which we hope you will enjoy and tell us how you are using them. Thank you to everyone who entered, it was fun reading through all of your entries. Also a big thank you from me for the huge support given by Laurie, Imy, Kyla, and Iris. They have worked tirelessly behind the scenes this last week or two to make this competition 'work'. 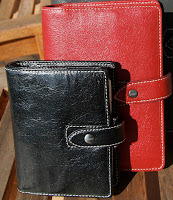 If you have only one, you have a Filofax.... but if you have more than one then what do you have? Several Filofaxes? Filos? what is the correct spelling for the plural of Filofax? You might have noticed I often skirt around the problem by writing 'Filofax Organisers' putting the plural on the organisers part... cheating I know, but heh I was an engineer, who had two attempts to pass his English Language O Level, so what do I know about these complicated rules of languages!! We have asked this question before, but it was about 2 years ago, it will be interesting to see how things have changed in that time! Here is the graph from last time. We are inching closer to the end of October, but what ever you want to ask questions about Filofax.... this is the place to ask them. This October, Filofax and Philofaxy would like to invite you to share your favourite Filofax memory. Whether it’s a tale about your first Filofax, the story of your first visit to the Filofax store or even a moment when a Filofax played an important part in your life, we want to hear from you! You will be able submit your cherished Filofax memories by 26th October at 23:59(UK time) to philofaxy at gmail dot com This can be beautifully handwritten, typed or even drawn onto the special Filofax diary page template which you can download from the link below. Filofax have kindly offered further organisers for this activity, so the first 6 to enter will receive a lovely personal organiser. 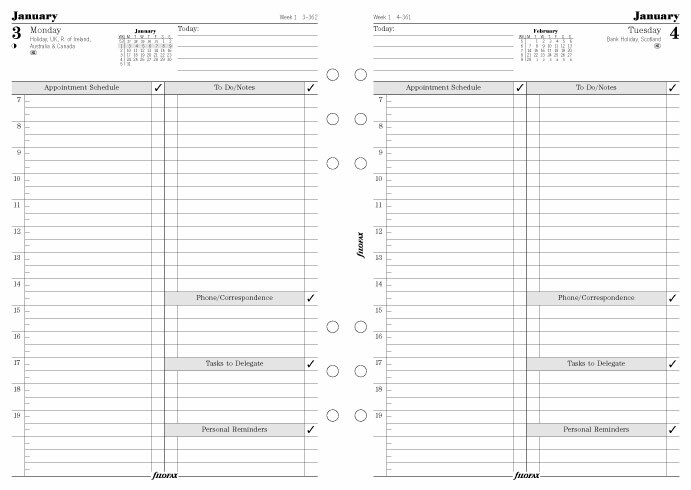 Have you ever woken up in the morning and thought 'I wish I could make my own organiser'? After my post the other day about page sizes. 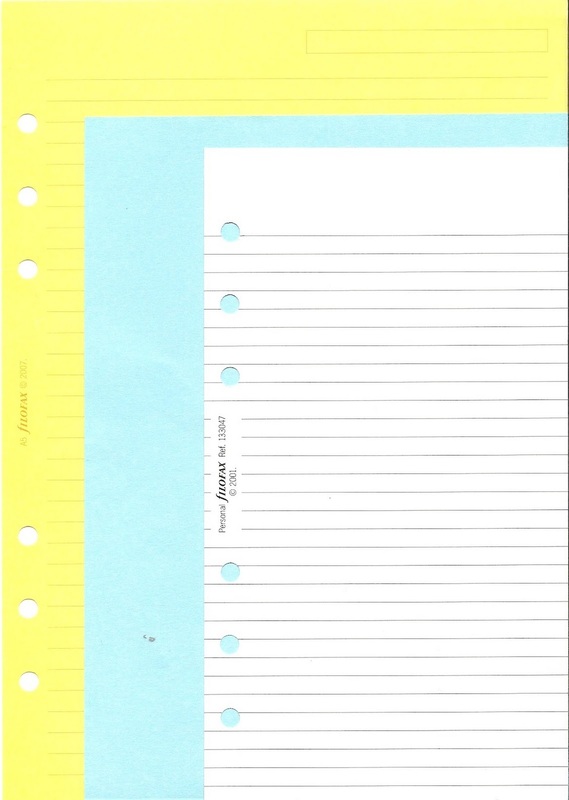 Wouldn't it be great to make your own organiser for what ever size paper you wanted. At first I thought the main problem would be finding a ring mechanism, people wouldn't want to wreck one of their existing Filofax organisers just to get a set of rings, with the possible exception of an Apex! Then I turned to the leather part of the organiser. Now I'm no craft expert my self, but I'm sure there are plenty of local firms in your part of the world that might be able to make a suitable organiser in leather if you gave them a suitable design or 'example' idea. Again a quick look on the web I found this small UK company making various leather goods of good quality and size to an organiser. They also have a range of tools and thread etc. So you could finish your organiser in what ever colour you wanted. 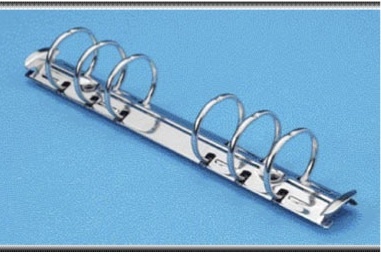 So it might be feasible to make or have made an organiser to your own design. 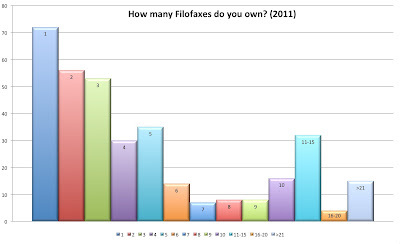 But before the legal people at Filofax start sharpening their pencils... I don't think they need to worry about us going in to competition with them with an aptly named Philofaxy Organiser... just yet! Happy Friday everyone! Got any big weekend plans? If you haven't already, spend some time this weekend submitting your entry to our Filofax Competition! Don't miss your chance to win a new Filofax! Halloween is coming soon, autumn is in full swing for those of you in the Northern Hemisphere. And shockingly, Christmas is barely two months away! How are you using your Filofax to plan the last two, ultra-busy months of this year? So yes you guessed it, I couldn't resist plugging some numbers in to Excel the other day in connection to Filofax organisers, to see if there was something I had over looked or may be explain why some sizes are more popular than others. So I decided to use the page area of the different sizes to see how they compare to each other between the different sizes. Another example, this time Personal to Pocket, your page size would be 60% of your current page size. This got me thinking... if people are tending to cycle between A5 and Personal size. The sort of thing we hear is people like the extra space that A5 gives them, but they don't like the additional bulk of an A5 organiser. Seeing the figures above it doesn't come as any surprise really as to why the A5 has such an advantage over the Personal size, but people are swapping too much between sizes. There's almost a case for another size between A5 and Personal, one say that in the same ratio as an A5 page 1:1.4142. This ratio is the same as the square root of 2, or the inverse of Sine 45 degrees, so there is some magic about the ratio of the height versus the width of the European paper sizes. So I compromised slightly and made it the same height as Personal (171mm) in the same ratio as A5 that gives a page width of 121 mm and a page area of 20691 sq mm Or 27% bigger than personal size. I doubt if we would ever see organisers available in that size, but it might prove to be a more popular size if it ever did go in to production. 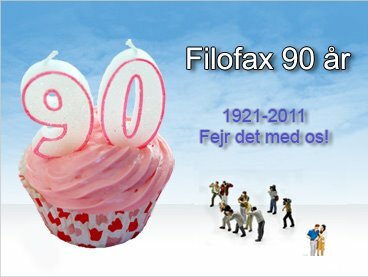 Philofaxy will then choose the top 10 memories to be uploaded onto the official Filofax Facebook page for fans all over the world to read and ‘like’. On the 4th November, the three memories which have the most ‘likes’ from the Philofaxy will receive brand new Filofax organisers as a very special thank you for participating in the challenge. Send your memory back by 26th October at 23:59(UK time) to philofaxy at gmail dot com who will then select their top 10 stories to be uploaded onto the Filofax Facebook page. Maximum of 3 entries per person. Competition open to all Filofax users worldwide. The three memories that receive the most ‘likes’ from the Philofaxy album will receive brand new Filofax organisers! But in terms of Philofaxy, Tuesday is the day you can ask any Filofax related questions!! What influences you in deciding what colour Filofax to buy? Some models come in quite a range of colours, the Domino and Finsbury seem to have a new colour added every year, replacing a previous colour, so there is always quite a range of colours available. Do you like to match colours between sizes, if you use more than one. Or do you match the colour of your organiser to your bag or desk accessories? As you can see in the picture above taken at the recent Philofaxy London meet up, red stands out as being a popular colour, all those crimson Maldens! Yes we did get our own back again! So if you were to be a winner in our current competition, and you were given the choice of colour of your prize, how would you decide? I hope the questions and answers below help to clarify any doubts you have and it will encourage you to enter the competition. Q1: Who is the competition open to? A1: Everyone, no matter where you are in the world, you can enter this competition and you stand just as much an equal chance of winning one of the prizes. Q2: Do I have to be identified in my entry? A2: No, you can enter under a nickname if you wish, Philofaxy (and I'm sure the other blogs) will maintain the confidentiality of your real identity. Q3: How can I enter if I don't have Powerpoint on my computer? 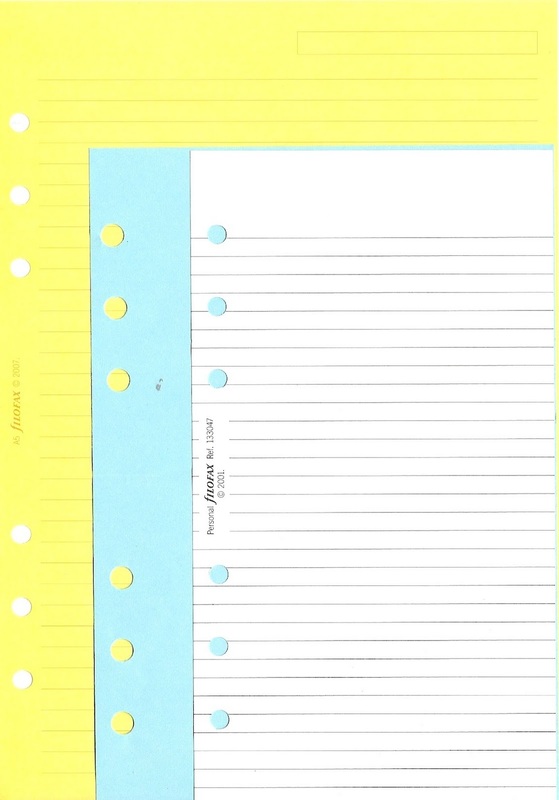 A3: Print out the PDF version of the file, and write your entry on the page in your own hand writing. If you have a scanner, scan in the full page and email it to philofaxy at gmail dot com, If you don't have access to a scanner, then I'm happy to accept entries by email, your entry will need to reach me by which ever route by the closing date. Q4: Can I enter the competition at more than one blog? A4: Filofax have suggested a maximum of 3 entries per person, I don't see any harm in you may be spreading those three entries between the blogs listed above. Q5: I have tried typing my entry in to the Powerpoint page and I've noticed that the text doesn't line up with the lines on the template picture. A5: We have noticed this and we will make sure your entry is readable before it is entered on to the Facebook page. Q6: Do I have to have a Facebook account? A6: No you don't have to have a Facebook account yourself. We look forward to receiving lots of entries. How do you Flex? - TT Patton - err I've seen that face before somewhere! Anyone who has been on-line in what ever form will have experienced some incredible changes in the last 10 days. Release of the latest Ubuntu 11.10 operating system. The announcement of any Apple product always brings an avalanche of press comment. This was closely followed by the sad death of the co-founder of Apple Steve Jobs at the young age of 56, not old at all. At the start of this week the messaging system on that Blackberry phones use suffered some failure or other for over three days... it would be quicker to write a letter and post it in most countries! The release of iOS 5 globally at the same time nearly brought the internet to a grinding halt with people trying to download the latest release. The release of Ubuntu 11.10 will have less of an impact I'm sure, but it's still a sizeable download. At home here in France as well as all of the above, although we don't use Blackberry thank goodness... my wife's PC suffered a problem the other night after a Windows update. So she is now using her netbook with an external keyboard, monitor, mouse, until we can get her a replacement machine (most probably an iMac). So I sit here on Friday night thinking back over this last week or so and think how crazy all of this is. Technology is supposed to make our lives easier. Judging by the messages I have seen on Twitter this last week from Philofaxy readers and from some of my old friends in UK, it's hardly been a 'walk in the park' with downloads failing and devices not updating. It's a pleasure to hold in your hand and be seen to be using. I mourned the death of Steve Jobs last week... I will not be mourning the death of my Filofax for a long long time to come. But as it is Friday you are of course free to discuss anything Filofax related. I was thrilled when I received an email from Steve asking if I would like to do a reader under the spotlight post. I love reading those of others!! Anyhow, I'm Tracy and I live in Lincolnshire. I am a full-time mum of two girls, and also a full-time student at the University of Lincoln reading Psychology with Forensic Psychology. I am a big fan of Filofax and have never got on with technology. 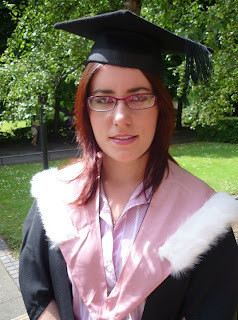 I have my own blog which I only started a couple of months ago. The first Filofax that I bought and still own was a Mini Identity. I found it the other week whilst having a sort out. I used to love it, and felt very sorry for it when I looked inside and it was empty. So now it has spare diary pages in. I always cringe when I think of this question, as I feel like a traitor to Filofax. I have used Moleskine diaries numerous years but have never stuck with them. I have also used normal diaries that come out at Christmas time. But, I always come back to Filofax. I absolutely adore my Vintage Pink Personal Malden. I saw people on Philofaxy ranting about how great the Malden was and I never believed it until I looked on the Filofax website. I immediately thought, "wow, I have to have one". I currently own 10 Filofaxes. My personal Malden is used for everything. All day to day stuff and information I need to remember. It has my diary, to do's, cards, and plenty of note paper. My A5 Finsbury is used for my uni work. I take it to lectures with me and take notes. My mini Lyndhurst is taking a well earned break, and the pocket urban has just temporarily come out so I can update the diary. I love the flexibility the Filofax can offer. You can put as much or little into it as you want. Then if you want a change, you can. I would be more likely to design the refills for a Filofax rather than the binder itself. 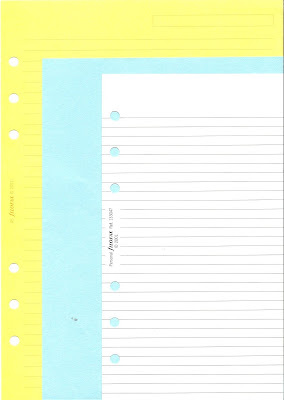 I would like to see more funkier diary refills and subject tabs. I find they are very plain. They need more colour and patterns. I usually carry my A5 Finsbury in my hand when going to uni. All other Filofaxes generally go into my handbag. 9. 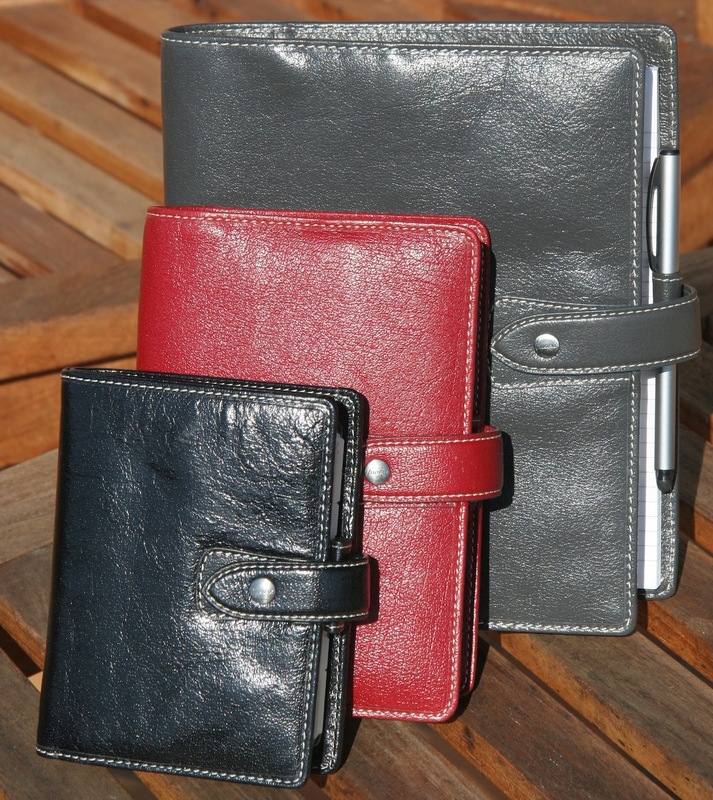 Which Filofax in the current range do you like the most? Are you going to buy it? Mmm. This one has been quite a subject of debate for me. I love my personal Malden but was finding it hard carrying that and the A5 around with me. 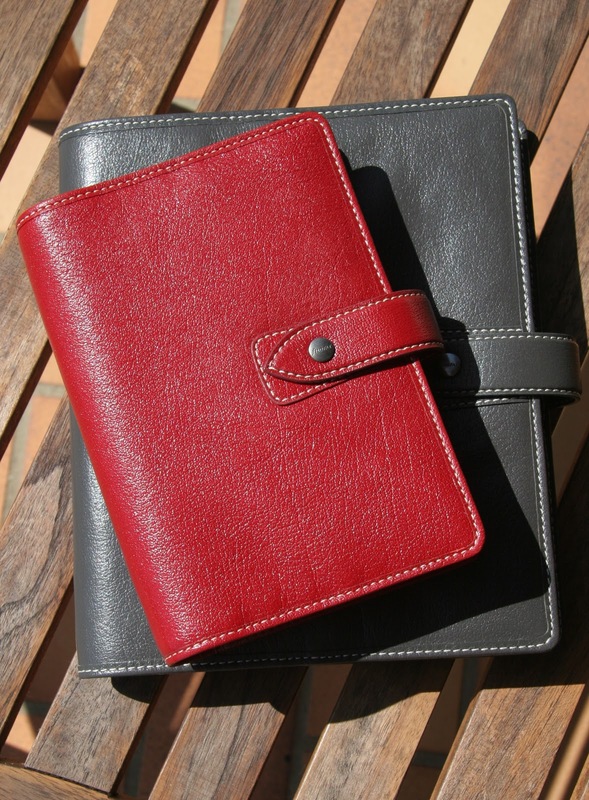 It seems that no other Filofax can match the expectations of the Malden so I have just ordered myself a pocket Malden in crimson. Ooh I hope my other half doesn't read this. The most I have spent was £35. It was my personal Malden, bought from a lady on Philofaxy adspot page. It was a good purchase. I tend to look for bargains, and will very rarely pay full price. I love reading Philofaxy full stop. I take a look every day to see what is new. I love reading about what other people keep in their Filofaxes. I get some good ideas from it. I also like reading the comments to the posts. 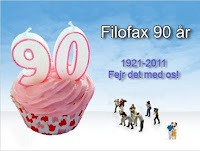 Everyone has a story, hint or suggestion to share, and they are all passionate about Filofaxes. Are you joking????? What is there not to like???? Since getting an iPhone I don't buy cd's any more. Which is quite sad in a way. The last album I downloaded was the latest Red Hot Chili Peppers album "I'm with you". It's fantastic. Thank you Tracy for going under the spotlight and we look forward to meeting you at next months London Meet up. 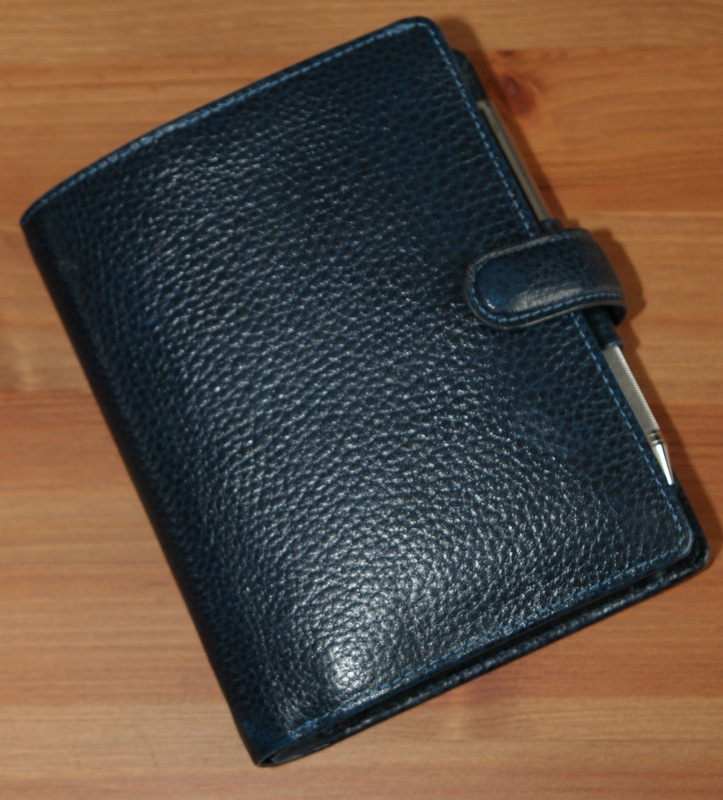 So what Filofax related questions do you have for us this week? For most of this year I've been using a page per day A5 Business Style diary along with a Personal size week on two pages diary in two different organsiers. The A5 size has been great for me because it has lots of room for to-do lists and reminders. But the downside is, it is a lot of paper in my A5 Filofax. As I don't have that many appointments in any one day, so I was looking for something in a Weekly format rather than Day format. However, I like the constant reminders about things I need to do today or this week. It would also be nice to have everything in one Filofax rather than two. At the moment my A5 deals with future events and the personal acts as a journal for past events. I like the idea of keeping the future and past separately, often my plans do change, so what I planned and what happened might be different. So after a bit of thought I came up with this idea; a Week on Two pages, but in A5 for past events. I chose this layout because of the equal spacing for each day and also the English only format. At first I wasn't sure about this layout, but then looking at what I've been entering in my page per day in the last 6 months or so, I think this weekly layout will work quite well for me. It will allow me to prioritise to-dos and tasks better put in reminders for birthdays. I will most probably use the Phone, Write, Fax, Email area for Blog posts as well. Both inserts are in A5 size so they will both go in to one A5 Malden and I will use two today markers to bookmark the current weeks in each diary. For the rest of my set up for 2012 I have quite a choice, I could go Pocket with a simple week per page diary and also use this as my wallet. Or stick to my current set up of Personal with a Pocket as just a notebook/wallet. Endless possibilities I know, but I have the organisers and the inserts for what ever I decide to do for my portable set up. I realise that there will be the need to synchronise my diaries between the A5 and the portable set up, but I do that now so no extra work really. So do any of you use two diaries in the one organiser like I'm planning to do in my A5? I almost can't wait until 1 Jan 2012 to get started using this new set up...! 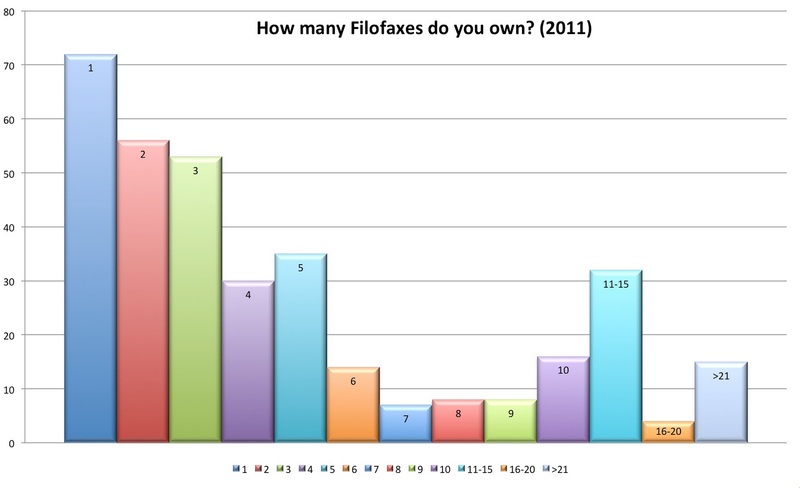 At the New York City meetup last month, we talked not only about our Filofaxes, but what we put them in. Some people simply hand-carry their Filofaxes. I do that on quick errands. Women, of course, carry their Filos in a handbag or totebag. More men are starting to carry an organizer bag (Mr. Morton), and that's an obvious place to carry a Filo. A few people asked me, with some concern, how I carry around my A5, the one I use for work. The answer is -- I don't! I take it to and from work in a wheeled laptop case. If I worked only in an office, I'd simply leave it in my office. The subject of carrying is on my mind now. By the time you read this, I'll be traveling in Ireland. And I'll have a Filofax in my backpack. Hi everyone! I'm so honoured to be able do a Reader Under the Spotlight! It's really interesting to read about other people's filofaxing, I thought I would try it myself! I run the blog The Perpetual Student, where I write about Filofaxes and studenthood, but mainly about Filofaxes! I bought my first ever Filofax, a raspberry personal Finsbury, this March. I saw it online and absolutely loved it, and bought it the next day from John Lewis! I have been hooked since then, and have bought many different styles since! I used to use generic diaries that I found in stationary shops, but never really stuck to them. I used an academic A6 day per page bound WH Smith diary successfully during school, and during the first years of university I used dodopad, and my iphone calendar. But none of them worked perfectly for my hectic uni life, until I found Filofax that is! Malden Malden Malden!!! I love my personal sized Maldens, but I don't know if I could choose between the crimson and the ochre! I love them both! *Cough cough* I think I'm too ashamed to count!! My mum would say too many! Around 10 I guess, maybe more! I use a personal for my everyday planner. I have 3 in the rotation- my crimson and ochre Maldens, and my raspberry Chameleon (I'm currently using my crimson Malden, but I may change in a couple of weeks when I get bored). It serves as my day-to-day planner, especially when I'm not at my desk (which is most of the time), with my DPP insert, and holds my cards, any important information I need when I am out (my 'reference' section with my mum's working timetable, important addresses etc), and some note paper. My A5 vintage pink Malden holds things that I don't need with me all the time like my housework section, meal plans etc, and most importantly my 'fun' section, where I plan for my blog, list books I want to read etc! I use my gorgeous new A5 Amazona for my university planner, it has my WO2P columned diary for planning my week, a monthly diary printed from Outlook to plan when I am going to focus on specific assignments, and details of uni work to do for each module! I love it, it's really helping me to stay organised! It has to be its customisability! I can have it set up any way I want, and change it if it's not working for me! It's always evolving, but I hope one day soon I am going to set up my perfect planner, and it will work for me 100%, unlike any generic planner I could buy from a shop! All because of the genius of the rings! This is quite easy as I LOVE the Malden so I would just tweak that a tiny bit. I would have vertical card slots (because I prefer them), a more fuchsia-pink colour instead of the vintage rose, and 2 pen loops! It would be great if they made a compact Malden (Filofax, please take note!! ), and hopefully an A5 crimson Malden!! I carry my daily filo in my hand if I can, because I always want it near me. If it rains, I'm afraid it has to go away somewhere safe L The one time I put in my bag when I could carry it, it got a huge scratch on the corner! I can't carry my A5 Amazona in my hand all the time, especially as at the same time I still would be carrying my everyday filo, so that goes in my bag, but I feel really bad putting it in a bag with my keys, or in my backpack, so I might make a protective bag for it to go in when it's inside my backpack! Deary me, this could turn into an essay! Of course I love a lot of them… But if I could own one more, at the moment it would be the compact Osterley in plum… although I don't know if it would really suit me, because I think it's for much more grown-up ladies (read: well-dressed business women) than me (scruffy student)! Actually… I would LOVE an A5 Malden in Ochre… after seeing some pictures of it, I wish I had bought the Ochre A5 instead of the vintage pink! It's such a gorgeous-looking thing! But I couldn't excuse another one… until my next birthday, maybe! I must confess… £100 on my A5 Malden, but it was my graduation present for myself, and it did help donate £8 to the Philofaxy charity fund! I know that's a lot of money to spend on one filo, but I have saved quite a bit of money with some of my others, and I see all my filos as an investment, I will use them for the rest of my life! Ever since I found the site when I first became obsessed with Filofaxes, I have felt like this is a great community where people are so kind and I really feel like I belong! You guys are the only ones who understand my addiction!! I feel so at home here! For that reason I love FFA Ts and Fs, and I really love reading all the other posts too! Plus I love the Flickr group! I wish you would stop enabling so much! My bank account can't handle it!!! It was Adele 21, I love her, she is so talented! Thank you Kate for agreeing to be our latest reader under the spotlight. Well it was bound to happen... having bought an A5 and Personal size Maldens in March this year, I just couldn't resist the Pocket Malden that Jotje announced as being for sale on Twitter, it was instant snap decision. 'Yes I will have it!' And she kindly brought it along to the Meet Up last weekend. So the 'family' is as follows, (back left) A5 in Grey (30mm rings), (back right) A5 in Grey (25 mm rings) which was the original one! And in the front row, Crimson Personal (one of many) and Black Pocket. So of course you are going to ask what am I going to be using them all for... yep thought you might. A5 Grey (25 mm) - This is my current desk planner with the day per page (business diary) insert in it and a few other pages. I've been using this set up since about May. A5 Grey (30 mm) - I'm setting this one up for use next year with a slightly different set up to this year in the other A5. I will be publishing the details of this set up once I have settled on set up in the forthcoming weeks. But it's handy having the two A5's, so I can leave one as it is whilst I set up the other one. Crimson Personal - This is currently used as my carry around Filofax with a Week on Two pages diary which I tend to use as a journal rather than a planner. I use the address section on this one quite a bit too. Black Pocket - I'm going to consider swapping my Chameleon Pocket for this one. Again I will be publishing a post comparing the two organisers, because there are some pros and cons between them, so it will be interesting to share them with you in the coming weeks. At the moment the Personal and Pocket both have fairly standard fills in them, but they are likely to change in the coming weeks as I set them up for the forth coming year. Now what about a Mini... hmm tempting. Although I doubt it would ever be used... famous last words! Filofax UK have a 4 for the price of 3 offer for the rest of October, on Paper and Essentials only one order per person attracts the discount. 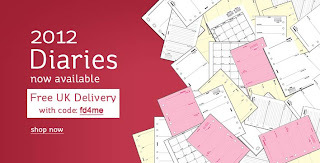 Filofax UK also have a Free Delivery offer on UK delivery on all 2012 diary inserts. Only one use per person, and again valid until the end of October. Filofax UK still have their 'Last Chance to Buy' sale page running which includes 50% off the Crimson Malden Personal and Pocket organisers. This is becoming a popular 'must own' organiser if the recent Meet Up pictures can prove...I counted 5 crimson personals.. and there was only 11 of us there! The Filofax Finchley looks as if it is also in its last throws and it being sold off at a discount price. WH Smiths in UK also still have their 'up to 60percent offer' running on Filofax Organisers and inserts and accessories. All of the above offers will earn commission, which will be donated to a UK cancer charity later this year. So what questions do you have for us this week?